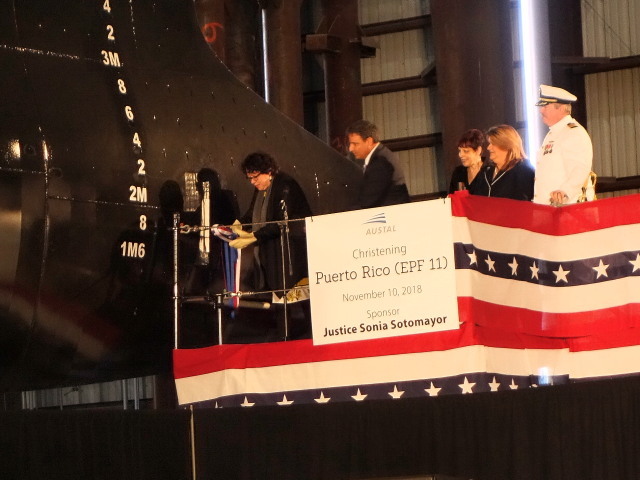 Austal celebrated the christening of Expeditionary Fast Transport (EPF) the future USNS Puerto Rico (EPF 11) with a ceremony at its state-of-the-art shipbuilding facility this morning. Puerto Rico is the eleventh of 12 EPFs that Austal has under contract with the U.S. Navy with a combined value of over $1.9 billion. Nine Spearhead-class EPFs have been delivered and are serving as an affordable solution to fulfilling the Military Sealift Command’s requirements worldwide. The future USNS Burlington is scheduled for delivery to the Navy later this month and two more EPFs, including EPF 11, are under construction at Austal’s Mobile, Ala. shipyard. Austal also received instruction from the Navy to order long lead-time materials for EPF 13 in October. This entry was posted in Christenings and tagged christening, christenings. Bookmark the permalink.